Join us this winter for Intermediate and Therapeutic Yoga Classes in the Ghosh Lineage! Every other Sunday, from January 15-April 23, join BYCA owner and mentoring teacher Ann Chrapkiewicz for classes focused on specific areas of the body. In these classes, we will combine therapeutic exercises for specified sections of the body with preparations for intermediate yoga postures in the Ghosh lineage. Each session is limited in size to 10 students, ensuring individual attention to each level and need. Those with at least 250 classes experience in the 26&2 will be guided into intermediate progressions. Those with less experience are welcome to join and will get much benefit, but may need to observe some portions of the class. We ask that participants in these classes have a strong sense of focus, discipline, and therapeutic intention in their regular yoga practice. A 3-4 day-per-week 26&2 practice (i.e. Bikram Yoga) is important preparation for these classes. 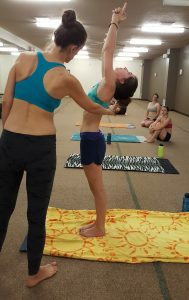 Backbending techniques at a 2016 BYCA Workshop. These classes are free to those with the Optimum Health & Wellness Memberships, and $25 to all others. $120 for unlimited classes in this series. Click here to purchase one or more classes. BYCA owner Ann Chrapkiewicz began practicing Bikram Yoga in 2003 and intermediate practice in 2009. She completed the inaugural Ghosh Practice Week with Ida Jo and Scott Lamps in the summer of 2016. Please contact us for more information.